Just a quick post to let you know that I am hosting a giveaway over on my Facebook page … you don’t have to do anything fancy, I’m just trying to increase the amount of people that I reach. 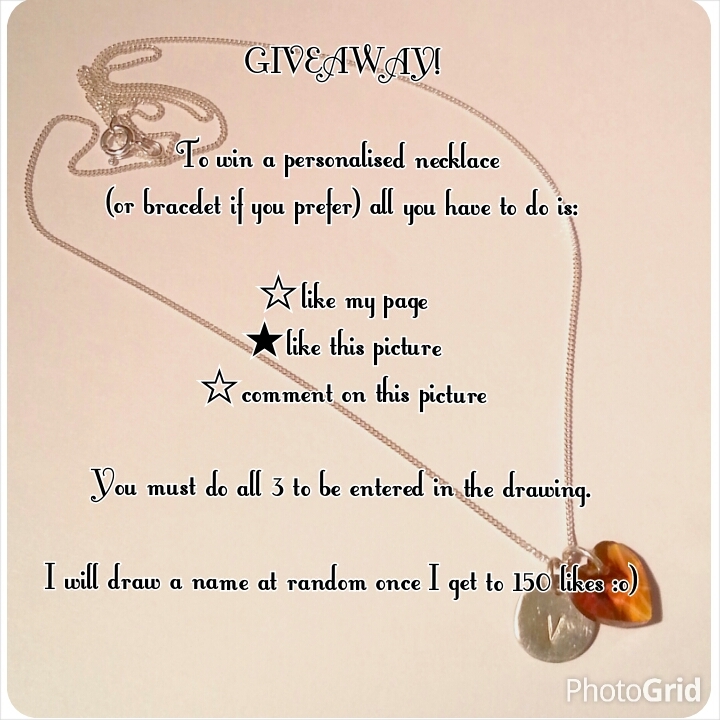 The winner of the giveaway will get a personalised necklace from my, free of charge. I’m also trying to get reviews to show on the page, so if you have ever brought anything from me, please let me know what you think. If it’s good feedback it’s nice to hear, if it’s not so good then I need to know if I am doing something wrong. I’m off now to buy some more supplies! I should have a couple of ranges to announce towards the end of the week and maybe some new inspiration photo’s.